Bali Dirt Bike at Tabanan Sunset Beach Special Tracks ! Bali Dirt Bike at Tabanan Sunset Beach, Good to ride year round, Tabanan Beach trail takes you along over 40km of picturesque coastline. Get to explore the beaches other tourists never see while taking in views of local fishing villages and the Indian Ocean. You will also navigate multiple river crossings as you make your way down the coast. Experienced riders will enjoy the thrill of pure controlled drifting and will be able to reach speeds of 150kph. As the day comes to an end, riders of all levels will be able to experience an unforgettable Bali sunset as the sun sets bellow the waves. One of the challenging track with amazing vibe ! Pick & Drop off ;Hotel/Villa transfers to base camp / starting point in AC Minibus. Safety Equipment ;Helmet & goggles, boots, gloves, elbow & knee pads, chest protector, top & pants. Bike Insurance; All damage to the bike and gear is covered in package cost. Start your engine and enjoy the stunning tracks ! Experience the various trails Bali has to offer. 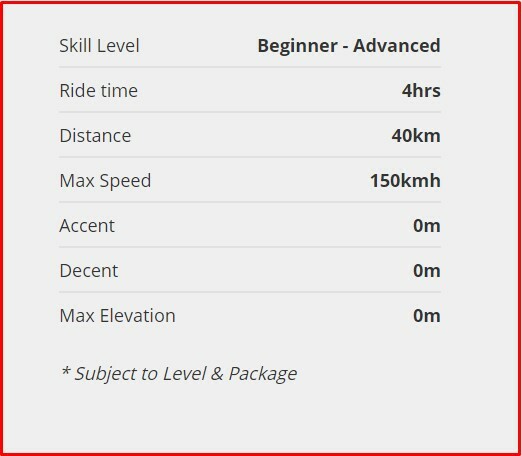 Suitable for all levels of riders. Our trained guides will show you the most spectacular views of Bali and take you to areas very few people can access. Our experienced guides will give you tips to surpass your limits.